In Italy’s South Tyrol, autumn means new wine, and new wine means Törggelen. 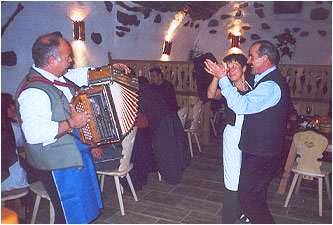 Derived from the Latin “torculum” (wine press) before becoming rendered as “Torggl” in local dialect, this tradition began in the Valle Isarco of the Dolomites, where winegrowers in the valley would put their livestock under the charge of herdsmen in the mountains during the summer. 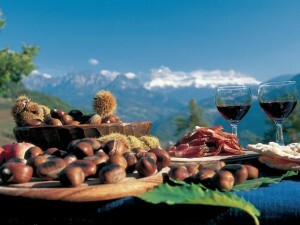 In the autumn, when the herdsmen descended into the valley with the livestock, the winegrowers would receive them with a feast of Tyrolean specialties: speck (cured and lightly smoked ham), kaminwurzen (chimney smoked sausages), dumplings, roasted chestnuts, and, most importantly, the year’s new wines. Even if you aren’t herding livestock, you can still taste the new wine and feast on local dishes at the buschenschank, farmhouse taverns that serve their own wine and regional dishes during Törggelen. Some of the traditional dishes served at the farmhouse taverns during Törggelen are dumplings, spinach-stuffed ravioli, sweet buns stuffed with jam, and roasted chestnuts, but each farm has its own specialty. Besides the new wine, Törggelen is an excuse to taste the farms previous vintages, and learn a few square dance steps. Typical wines of the South Tyrol include the white Müller Thurgau with a fresh bouquet of apricot jam, the intense cherry red Lagrein, and spicy Pinot Noir, which finds its ideal climate here. Work up an appetite by arriving at the buschenschank on foot along one of the beautiful walking trails near Bolzano, gateway to the Dolomites. 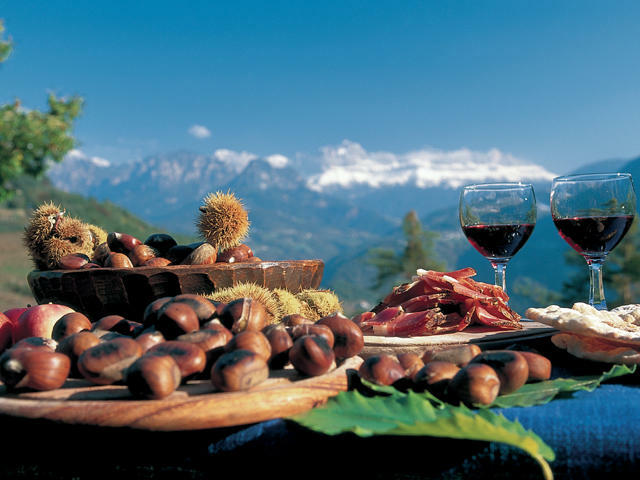 Walking routes include paths through well-tended vineyards and apple orchards, and through magnificent chestnut woods – South Tyrol’s culture of chestnut tree cultivation dates back to about 600 A.D when a boom in wine production led to increasing need for chestnut wood casks. The Ebnicherhof farmhouse tavern above Bolzano can be reached on foot in 90 minutes along the Chestnut Trail, idyllic in autumn when the countryside is ablaze with color. If you are too full to walk back, many buschenschank also offer accommodation. Buschenschank farmhouse taverns are open for Törggelen from September to Christmas all over Italy’s South Tyrol, and the cream of the crop are recognized by the South Tyrol’s Farmer’s Association, which has a recommended list of these farmhouse taverns. Advanced bookings are normally required.